At the 'eleventh hour of the eleventh day of the eleventh month', Australians held one minute’s silence, in memory of those who died or suffered in all wars and armed conflicts. With small and large services held at War Memorials, aged care facilities, schools and in towns across the country, 11 November 2016 marked the 98th anniversary of the Armistice, which ended the First World War (1914–18). 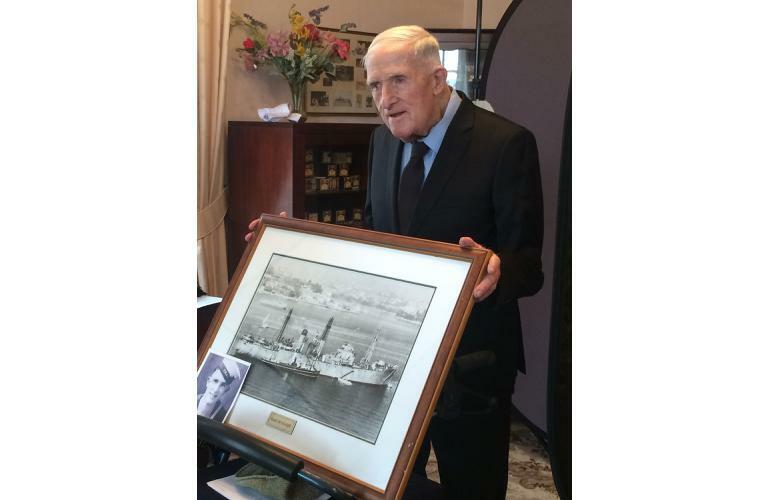 The last time Harry Ray had his official war portrait taken, he was just 17 years old and about to head to sea with the Royal Australian Navy to fight for the Allies. In September, he and three other World War II veterans sat for a second portrait at ACH Group’s Kapara Residential Living at Glenelg South, as part of the Australian Institute of Professional Photography (AAIPP) Reflections Project. They are among 7,000 veterans across Australia whose photographs will be archived at the Australian War Memorial in Canberra. The project is a partnership between the RSL and the Australian War Memorial and was launched last year as part of the Anzac Centenary commemoration. A total of 450 photographers signed up to volunteer their time, many of them travelling long distances to reach Veterans living in remote parts of the country. Another Remembrance Day project that began as a small personal tribute by two Australian women to honour their fathers who both fought in World War II, has become an international tribute of respect and remembrance to those who have served their country in all wars, conflicts and peacekeeping operations. Lynn Berry and Margaret Knight initially set out to crochet a humble 120 poppies to “plant” at the Shrine of Remembrance in Melbourne Australia for Remembrance Day in 2013 in honour of their fathers Wal Beasley (14/32nd Battalion – Australian Imperial Forces) and Stan Knight (Queen’s Own West Kent Regiment – British Army). This sparked a massive community outpouring with an estimated 50,000 plus contributors to the project and hundreds of smaller localised installations throughout Australia, New Zealand and beyond. More than 300,000 beautiful handcrafted poppies have been contributed from all over the world. Contributors include children as young as two, right through to people aged 102, and from many different backgrounds and cultures. Known as the 5000 Poppies Project, last year the poppies were on display in Federation Square and Princes Bridge as part of the ANZAC day parade, and at Melbourne Flower and Garden Show. This year, the poppies have been part of the Royal Chelsea Flower Show in UK, the Fromelles Cobbers memorial in France. 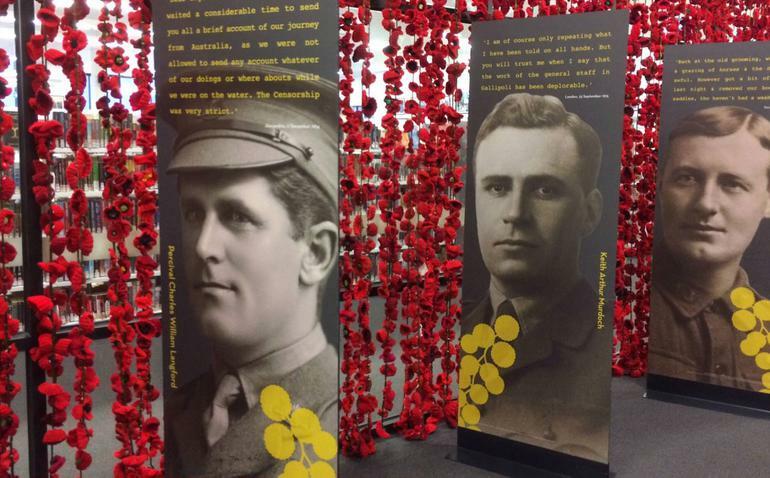 10 000 of these poppies are currently on display at Plaza Library, Werribee Victoria as part of the Writing the War exhibition. Remembrance Day was initially a Commonwealth tradition inaugurated by King George V in 1919 after World War I - the time and date correspondent to when World War I hostilities formally ended ‘at the 11th hour of the 11th day of the 11th month’. The tradition of silence at this time and on this day, together with poppies, a symbol for the blood spilled in the war, soon spread to other countries. For more information about Remembrance Day events in you area contact your local RSL branch.